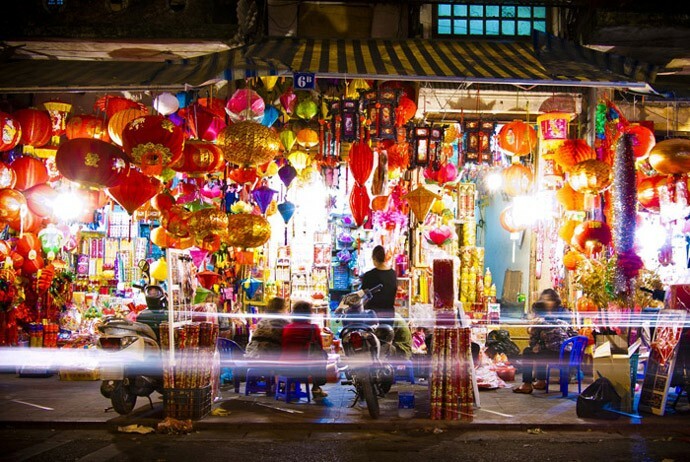 Home » Vietnam Travel » Hanoi » Shopping In Hanoi, Vietnam – What To Buy And Where To Buy? Hanoi, the capital of Vietnam, as being described by a lot of visitors worldwide, is such a quaint, chaotic, and full of life city (something more like a big village) with enthralling street foods and inspiring energy. Despite Hanoi does not have the nightlife like Bangkok’s nightlife, or the trending culture of Tokyo, it still has a distinct flavor as well as energy of its own. It features a fascinating blend of Eastern and Western cultures with a big deal of Chinese influence. The city of Hanoi with more than 1000 years of history, not mention to its difficult past, is like an outlet mall, where visitors can shop for treasures made in dozens of small craft villages around it. With the vast modernization and urbanization that this city has been undergoing, it is currently reckoned as one of the most targeted shopping destinations in the tourism industry. Here is no lack of choice when it comes to shopping in Hanoi, the capital of Vietnam. This one-thousand-year old city offers tourists a wide range of items for those who love shopping. The city has also a good range of day and night markets, both outdoors and indoors. If you are particularly enthusiastic about quality textiles, handicrafts and clothes, shopping in Hanoi will not disappoint. Actually, Hanoi is a great place to purchase specialized products like pottery, silver, and silk products. So, now if you are wondering what to buy and where to buy when shopping in Hanoi, then you should not skip this article as here we will give you some of the most interesting and useful ideas about shopping in Hanoi, Vietnam. Take a look! There, you have had a checklist of what to buy when shopping in Hanoi, Vietnam. Now, it is time for you to know where to buy them. If you want to buy some silver products as the gifts when visiting and shopping in Hanoi, Vietnam, then Hang Bac Street is your best destination. Being one of the oldest streets in Vietnam, Hang Bac Street (Phố Hàng Bạc) is famous for silver jewelry and antiques. Silver goods produced here are made with secret methods that have been passed down for many generations. This is really a charming street to explore, rich in culture and history aside from jewelers selling beautiful Vietnamese pieces. There are also stores selling antiques and art here. When tourists ask local people or tour guides where they could find a variety of traditional Vietnamese gifts to buy like souvenirs, most of them will get the answer “Hoan Kiem Lake” (Hồ Hoàn Kiếm) and “The Old Quarter” (Phố Cổ). The reason behind this is that they are the most exciting tourist areas in Hanoi where seductively attract a lot of foreigner tourists to visit daily, so there are various souvenir and present shops situated in these areas. Those international tourists are easily caught wandering around this area both daytime and nighttime to visit and explore the historical and cultural beauty of Hoan Kiem Lake and the ancient houses in the Old Quarter, and to buy some souvenirs or handicrafts to bring home as a great memory of such a charming city like Hanoi. 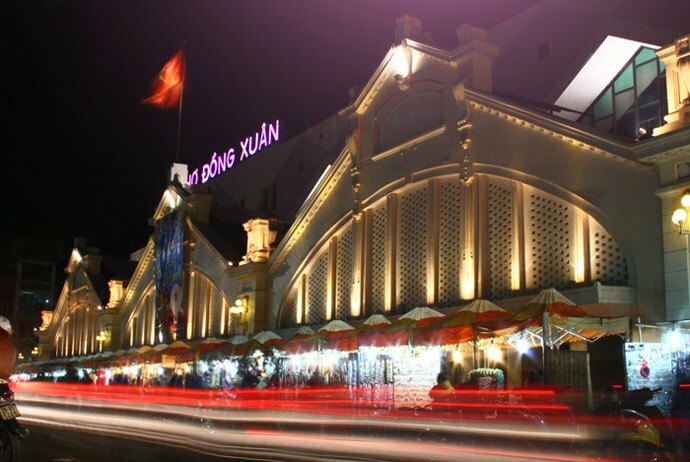 Particularly, in the evening, visitors can walk along those popular shopping streets like Hang Ngang (Hàng Ngang) and Hang Dao (Hàng Đào). These streets turn to walking streets in the evening, and more foreigners come to those busy and crowded streets to merge with locals and experience the amazingly exciting atmosphere of those places. 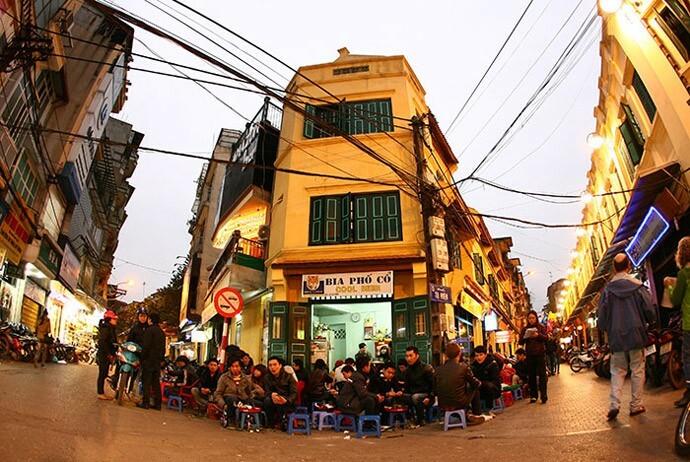 One of the most favorite streets in the Old Quarter of many people when shopping in Hanoi is Hang Gai (Hàng Gai). Also known as “Silk Street”, Hang Gai is well-known for high quality silk shops. 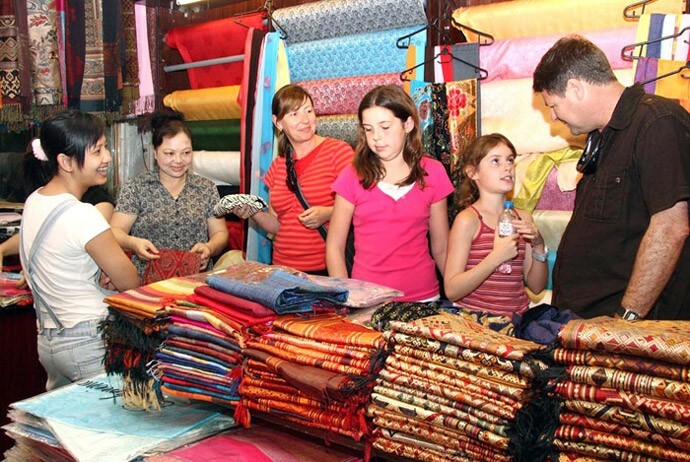 Be sure to drop into Khai Silk (Khải Silk) (96 Hang Gai) and Duc Loi (Đức Lợi) (76 Hang Gai). This is a great place when it comes to shopping Hanoi. Here you could look for well designed accessories and clothing, embroidered table cloth along with napkins, greatly crafted home decoration, bed linen, and some of the thoughtfully designed lacquerwares. In addition to Hang Dao (Hàng Đào) and Hang Ngang (Hàng Ngang) Streets, Hang Gai (Hàng Gai), Ly Quoc Su (Lý Quốc Sư), Bao Khanh (Bảo Khánh), Gia Ngu (Gia Ngư), Luong Van Can (Lương Văn Can) or Hang Can (Hàng Cân) are other favorite places for purchasing souvenirs. It could be sure that gifts and souvenirs sold in these areas are not only diverse in kinds with hundred types of traditional Vietnamese items but also ingenious because they are mostly handicraft products which are made by skillful artists in well-known vocational villages in Hanoi. 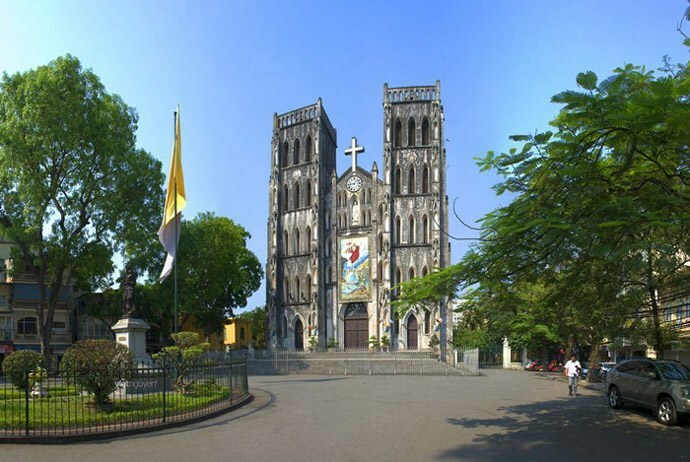 For example, you can go to Ly Quoc Su Street to buy unique T-shirts, Gia Ngu Street to buy quality under-wears at reasonable price, Bao Khanh Street to buy CDs and DVDs on latest TV shows at such a reasonable price, and Luong Van Can Street to buy kid’s toys as well as other decorative items. Besides, it would be a big mistake if tourists fail to taste dried spiced beef sold on Hang Giay (Hàng Giấy) Street and dried sweetened fruits or veggies (“Ô Mai” and “Mứt”) available on Hang Duong (Hàng Đường) Street. Additionally, Hanoi is the only place where tourists could see such authentic and delicious “Ô Mai” in Vietnam. This kind of snack is very high in term of specie which people might spend up to millions and weeks to taste all of them. Nevertheless, foreigners buy items in this area might have to endure a more expensive price than local ones. In fact, it is the result of high rental cost of the shops in central position of Hanoi, the capital of Vietnam, and also perspective of local vendors that the international tourists always have cash be prepared to readily bargain. Shopping in the Old Quarter could be a real challenge. Local people have the practice of shopping from their bikes so they can easily get closer to the road’s edge in order to look at the items for sale. The sidewalks are usually full of motorbikes, chairs, and tables for people and tourists to eat. That case, your choice is to walk on the road. For those who find the Old Quarter deserved to be one of their destinations for shopping in Hanoi, they can easily get a cab to take them there. Ask to be let down at Hoan Kiem Lake, preferably close to the red bridge. Then, from there, tourists could cross the street north to Hang Be (Hàng Bè), and start their voyage through the Old Quarter by foot. Just simply use Hoan Kiem Lake as a point and if you get lost, just ask a local where Hoan Kiem Lake is. 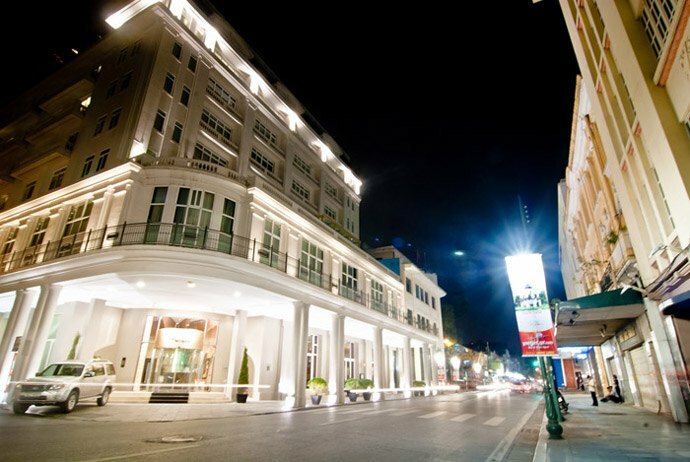 One of the most luxurious streets in regard to shopping in Hanoi is Ba Trieu Street which is a long road that starts at Hoan Kiem Lake area and leads to Dai Co Viet (Đại Cồ Việt) Street. This street is often described as a “Street of Shopping”, particularly luxurious shopping kind. The road itself acts as a small market of a variety of shops, restaurants as well as other convenient service destinations that serve all clients in any class and range, yet deluxe products seem to be more dominant and also diverse in Ba Trieu Street. Ba Trieu Street is about 2.5 km in length with numerous luxurious shops located densely on its sides. Tourists could find different kinds of products as well as services here, containing clothes, accessories, motorbike, phones, and entertainment devices. Apart from the high class shops which are rather expensive, this street also has a wide range of ideal shops for middle class with acceptable quality and affordable price. Especially, the most remarkable and biggest midrange destination at this street is Vinatex Fashion Center, in which you could find clothes and accessories made by domestic manufacturers with competitive price to customers of middle class. On other hand, located in Ba Trieu Street, Vincom Tower is reckoned as the heaven of superior shopping which is situated at the end of the street. Vincom Tower is the complex of deluxe shopping malls along with luxurious services that serve people with bigger purse than normal one. Here you can easily find almost reputable domestic and international brands in Vietnam, ranging from clothes, electronic devices, and shoes. Clients coming to Vincom Tower will experience high quality services and shops which might be just found in this shopping center. Keep reading the following points to discover more ideal destinations for shopping in Hanoi, Vietnam! Parkson shopping mall is a chain of shopping malls in Hanoi, Ho Chi Minh, and Hai Phong, Vietnam. Parkson is a luxury shopping mall where people can find mostly Spanish and some foreign brands like Zara. For those who want to get Parkson mall for shopping in Hanoi, there are two Parkson shopping centres in Hanoi, the two somewhat away from the Center, thereby making it essential to take a taxi. 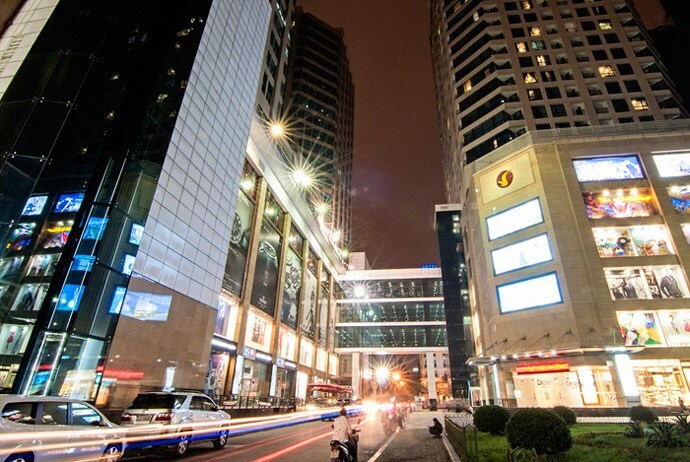 The nearest Parkson shopping mall is situated at 198 Tay Son (Tây Sơn) street and the other is at the foot of the skyscraper in Hanoi, Keangnam Tower. Dong Xuan market was established in 1889 on the area of Dong Xuan ward. This is a large market situated in the Old Quarter of Hanoi with hundreds of stalls available. Today, Dong Xuan market is rebuilt with a large scale, including 3 spacious, roomy, and modern floors, but still partly holds architecture of the old one. It is really a fascinating place for tourists to explore if they want to catch a flavor of Hanoian street life. As assessment, this is the largest traditional market of the city and is a highlight of a visit to the Old Quarter. This market offers all types of items that shopper look for, from clothing, shoes, hats, beads and fabrics, toys to food. In the weekends, the streets outside Dong Xuan market become a busy night market. Occasionally, there are musicians playing traditional music like Ca Tru (Ca Trù). This is reckoned a unique collection of old town night market attracting tourists, particularly foreigners. Van Phuc Silk Village is located on the banks of Nhue (Nhuệ) River, Nguyen Trai (Nguyễn Trãi) Road, 8 km southwest of Hanoi, belonged to Ha Dong (Hà Đông) District. It takes you about 30 minutes by motorbike to go there right from the centre of Hanoi. This village has been well-known for its traditional sericulture, silk and weaving products. Visitors coming here will discover a variety of beautiful shirts, ties, crafts dresses, and many other things that are made of silk. What special about silk produced in Van Phuc is that the silk is made by very simple looms, which is genuinely traditional Vietnamese method of making silk. Van Phuc Silk Village is the ideal place for both silk products and souvenirs with up to 1280 households, 90% of who are getting involved with this type of business. Many families in Van Phuc open their own shops on the major road of the village; create a “town of silk” that sells high quality, eye-catching silk products. It is estimated that this village makes over 2 million meters of silk each year. However, more than that, tourists are also offered a good opportunity to explore the Vietnamese traditional industry of silk-making. The sellers are very friendly and could speak a little French and English in order to communicate to foreign tourists. If you intend to buy something from Vietnam as gifts for those at your hometown, then clothes made of silk and silks are ideal choices. 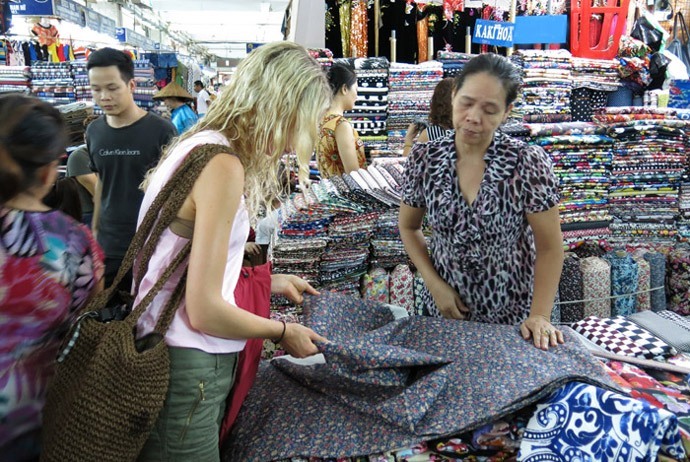 To get Van Phuc for silk shopping in Hanoi, you can join a tour to Van Phuc village available in travel agencies, or visit Van Phuc by cab, or motorbike. When shopping in Hanoi, Vietnam, if you want to buy some unique and decorative ceramic items, check out the following destination. Regarding to shopping in Hanoi, Vietnam ceramics is the products you should not skip. The ideal place to buy ceramics is nowhere except for Bat Trang Ceramic Village. This is small village in the north of Hanoi, Vietnam, is about 13 km south east of Hanoi center, on Chuong Duong (Chương Dương) bridge’s other side. This village is very famous for its ceramic and pottery high quality products. The vases, dishes, bowls and other types of ceramic products made from Bat Trang village have been exported all over the world. The products of village have developed and become famous for the best quality, glaze and style, both inside and outside of the nation. Many of them are now customized for aristocratic families as well as religious demands. The popular foreign markets are Japan, Britain, the Netherlands, Southeast Asia, Portugal, etc. 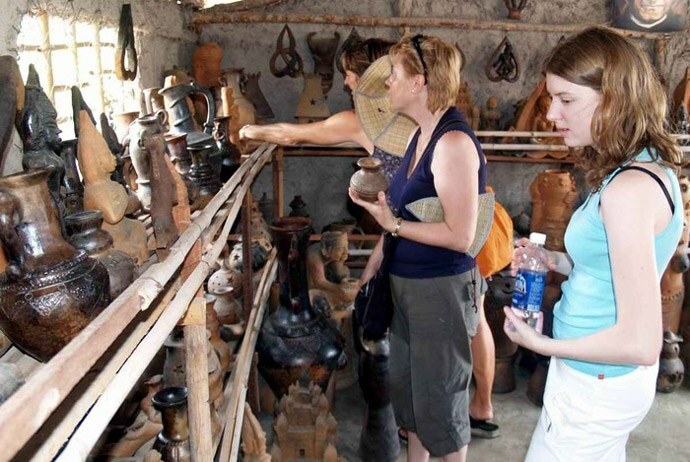 Bat Trang ceramic village has recently become a popular destination for the youth living in Hanoi (high school or college students) to visit during weekends. Also, it has become well-known among those foreign travelers who would like to understand more about the traditional and historical values in every handicraft product. Moreover, there are many travel agencies that provide tourists with one-day tour from Hanoi center to the village at reasonable prices. Trang Tien is the street where you can find art from the private galleries situated between the Hanoi Opera House and Hoan Kiem Lake. 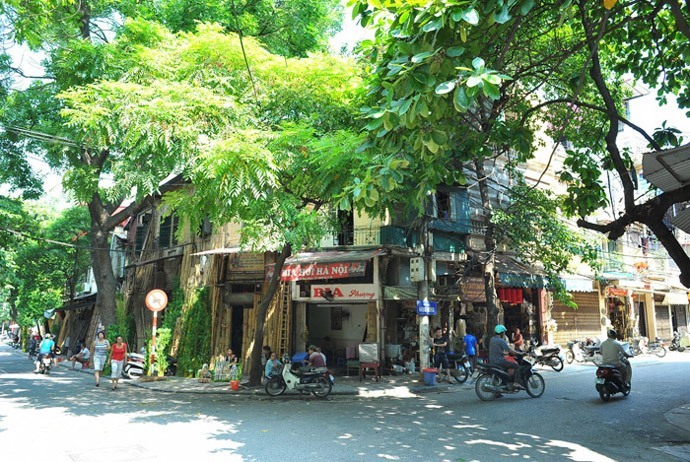 This is considered as one of the most visited streets in Hanoi, simply due to its proximity to the Old Quarter. For those who love books, it is even a must. There are a lot of types of books, in both English and Vietnamese, fiction and non-fiction, to be found in many well-displayed book stores as well as the vendors on the street. In addition to books, Trang Tien Street is also well-known for its prestigious ice-cream. Trang Tien ice-cream is a well-known trade mark and common among Hanoians. 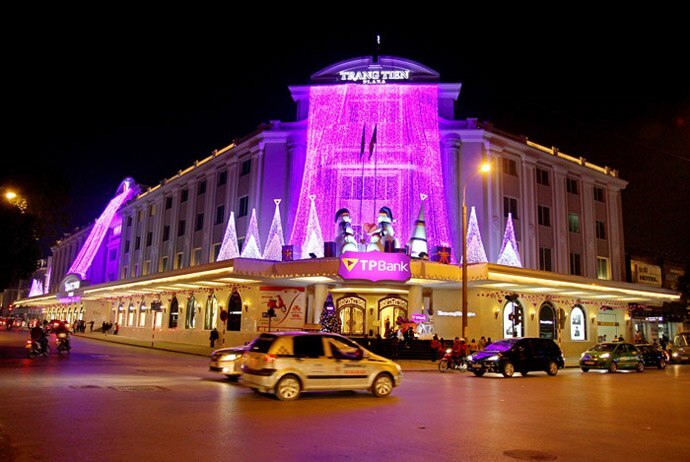 Trang Tien (Tràng Tiền) Plaza is where Hanoi’s rich and famous people come to shop for prestigious and luxury items, or international designer goods. 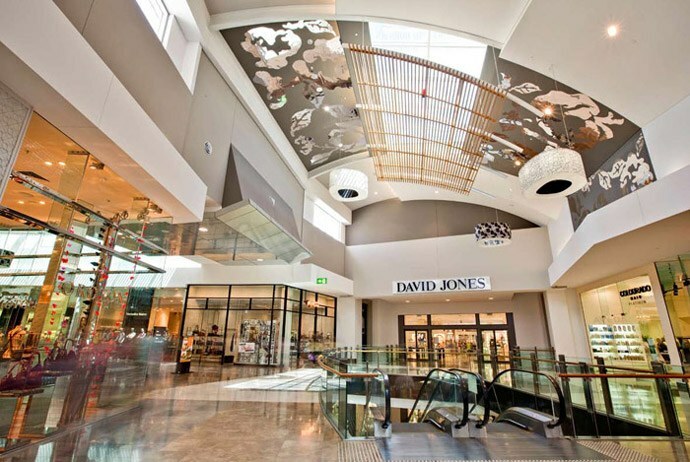 It is a shopping mall spreading out over 5 floors with many leading fashion brands including Burberry, Cartier, Louis Vuitton, and Ermenegildo Zegna occupying the ground floor. In addition, home furnishings and electronics spread out over the 2nd and 3rd floors; and a supermarket locates at the fourth floor which stocks a lot of international floor. Nha Tho Street is located in front of St. Joseph’s Cathedral and has a lot of small fashion stores as well as excellent restaurants – though only measuring 100 meters of length. 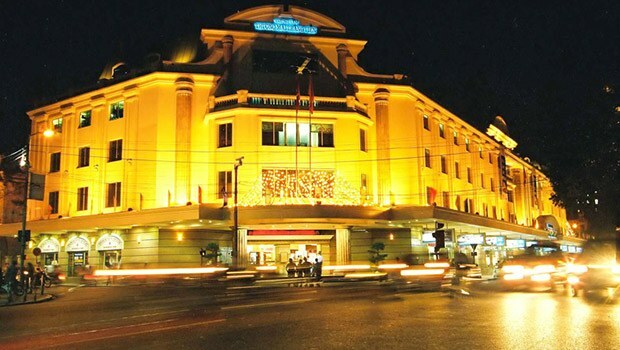 Being a popular destination for sophisticated set of Hanoi’s middleclass and foreign expat community, Nha Tho Street is worth a destination for those who are looking for shopping in Hanoi, Vietnam. Located in the heart of Hanoi’s central business district, Hang Da Market, among many other ideal destinations for shopping in Hanoi, is smaller than Dong Xuan and offers a more selective product range. This is the place for imported flowers, wine, second-hand clothes and fabrics. The outside of this building is very picturesque with its white multi-perforated façade. Hang Da is an ideal place to pick up one-off clothing stuff, including skirts, coats, and dresses. Some of the best buys are stylish second-hand clothes that are still in perfect condition. You had better visit this market in the morning when people are unpacking for the day. If possible, you should avoid visiting this market in the weekends or during the midday heat. Yet, do not forget to try your bargain talent here. Barganing is not only advised yet absolutely as shopping at Hang Da. As a rule, you should start at about 50% of the beginning price, yet do not accept any lower than 25%. You could buy god fruits and food at the first floor or try some unique Vietnamese foods here. Do not forget to take camera because Hang Da Market is worth visiting just to capture the elegant architecture of this building. 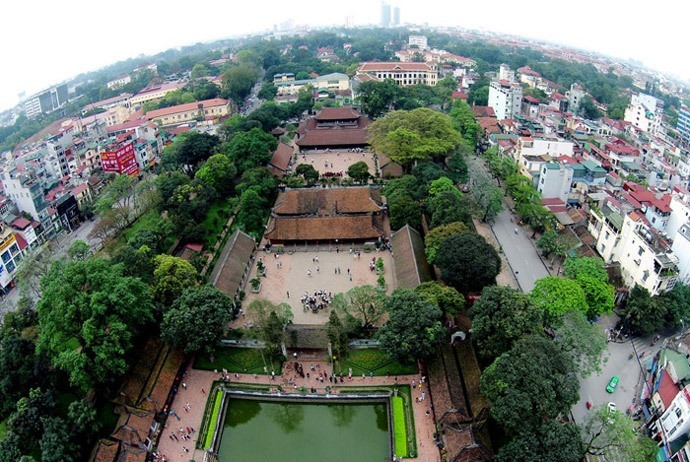 In general, Hanoi is the ideal shopping place for tourists all over the world. Hope that this guide brings to you some of the best tips when it comes to shopping in Hanoi, Vietnam. Regarding to shopping in Hanoi, Vietnam, it is worth noting that Hanoi shopping environment is very marked by the atmosphere of mercadillos, small shops of neighborhood and street stalls. If you are planning a trip to Hanoi, Vietnam in the upcoming time, then do not skip these places as they will offer you such a great experience when shopping in Hanoi. Vietnamese Bread Grilled With Salt And Chilli – Banh My Muoi Ot – Where To Enjoy In Hanoi?